Worldwide unique: Impressive oversize ID cards for accreditation, events, tickets and enterprises with the XL card printers from SwiftColor and ECP! Our XL card printers feature a comparatively rare two-in-one technology. First of all they are able to print ID and plastic cards in a regular ISO-standard format (about 86 x 54 mm). Furthermore they provide printing of XL and XXL plastic cards (e.g. 124 x 86 mm) that have been preprinted offset. 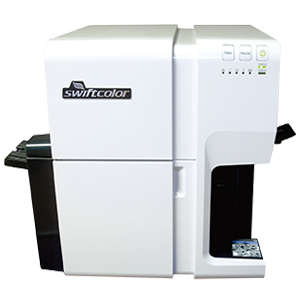 Besides SwiftColor card printers, such as the SwiftColor SCC-2000D and the SwiftColor SCC-4000D, YouCard offers the ECP X-Large D with two entirely different printing systems and methods to design your unique oversized ID cards. The application potentials of our XL card printers are nearly unlimited. Enjoy an impressive print quality and innovative card solution for your own event (e.g. concert, festival, congress, product presentation, exhibition or other major event), your company or club with a high recognition value. Even for accreditations and ticketing the demand for extra large plastic cards increases rapidly. Large-format plastic cards offer more space for your own content such as logos, exceptional designs, route descriptions or even advertising space for sponsors. The work of security personnel is greatly facilitated by the prominent XL cards. Technically our XL card printers convince to the highest degree. Due to to its high printing speed, up to 6,000 cards can be printed per hour! If you want to print on plastic cards in a specific format, our map-experts will be happy to consult you any time – of course, free and without obligation!